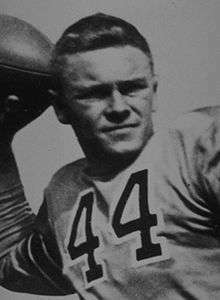 Paul Joseph Christman (March 5, 1918 – March 2, 1970) was an American football player and a member of the College Football Hall of Fame. He played college football for the University of Missouri and professionally for the Chicago Cardinals and Green Bay Packers of the National Football League (NFL). A St. Louis native, Christman led the Missouri Tigers to a 20–8 record during his three seasons as their starting quarterback. He was a two-time All-American, and led the nation in touchdown passes in 1940. He was Missouri's all-time leading passer until 1976, when he was surpassed by Steve Pisarkiewicz. While at the University of Missouri, he was a member of the Kappa Sigma fraternity. His jersey number, 44, is one of seven retired by the school. In 1956, he was inducted into the College Football Hall of Fame. Christman played six seasons in the National Football League, from 1945 to 1950. He was a member of the so-called "Dream Backfield", which led the Chicago Cardinals to the 1947 NFL Championship. A notoriously poor ball-handler, at one time he owned the record for most fumbles in a game (five) and most own fumbles recovered in a season (eight). After retiring as a player, Christman worked as a television color commentator, first teaming with play-by-play announcer Joe Boland to call Cardinals games for CBS in 1958 and 1959. In 1962 he began calling American Football League games on ABC with Curt Gowdy, a pairing that continued after AFL rights shifted to NBC in 1965. Christman called Super Bowl I with Gowdy for NBC in January 1967. In 1968–69 he returned to CBS, teaming with Ray Scott on NFL broadcasts. Christman also called the collegiate Orange Bowl game for several years, teaming with Boland (1960), Scott (1961), and Gowdy (1962–67). He and Gowdy then called the Rose Bowl game in 1968. Christman's daughter is noted Scientology critic Tory Christman. Christman's older brother is former Major League Baseball player Mark Christman. Christman died in 1970 in Lake Forest, Illinois from a heart attack. ↑ "Christman on Pro-Football-Reference". rbref.com. Retrieved 2007-12-31. Pro Football Hall of Fame article on the "Million Dollar Backfield"